I left my solitary confinement and was glad to remove the ear plugs I had worn all night. Recently I’ve been feeling a continuous low frequency hum and stuffing things in my ear canal is unlikely to help. 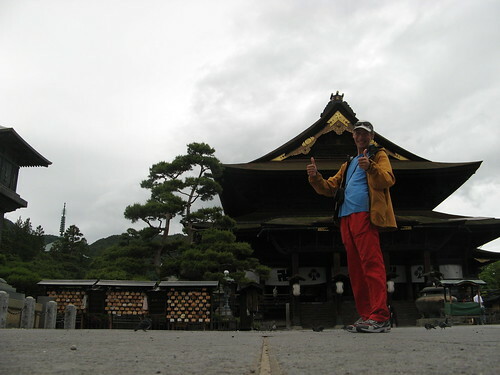 As predicted it had started raining over night and continued all the way to Nagano. By then there were sunny spells developing but I caved in and paid for a room at Hotel Nikko, the cheapest the tourist office could find. 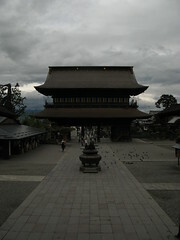 Without my bag I was free to explore town and headed for the Zenkoji Temple complex. 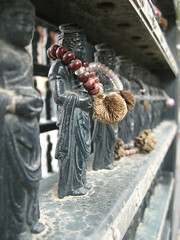 It has the whole lot, a gate, a temple, a multi-tiered pagoda and streets lined with expensive food and tourist trinkets. Afterwards I wandered around down town looking for a cheap restaurant and free WiFi. I ended up waiting half an hour for an “antique restaurant” to open but I needn’t have bothered. It was nothing special and since I was there when the door opened there was no-one else there to talk to. The waitress gave me the same blank look I’ve had elsewhere, as if they don’t know what I’m doing there. I have to announce that I’m hungry and would like food, here, in this restaurant, before I get offered a seat and brought a menu. Yeah… I like that… has a ring to it. Nice thumbs up tourist shot btw, its good but next time, with more… intensity. best laugh I’ve had in a while. thanks buddy.